Kochi: The National Commission for Women has decided to probe into the issue of the case charged by the Karnataka police against journalist KK Shahina. Commission chairperson Ms Girija Vyas opined that the act of the Karnataka government was an invasion against women’s rights and right to work. Those concerned have been asked to submit the media reports based on the issue, she added. Shahina KK, Kerala correspondent of ‘Tehelka’ magazine, was booked in a case of intimidation by the Karnataka police last month. Shahina had met two witnesses in the 2008 Bengaluru blast case and published a report in the magazine on its basis, refuting the claims of the police in the case. The police then charged the case against her. Shahina has submitted an anticipatory bail plea in the Madikkeri Sessions Court which has been postponed three times and is now scheduled to be taken on January 1. The hearing was completed and the case postponed to December 20 for judgement, but had to be postponed on the request of the prosecution asking for more time. It was postponed first to December 22, then to December 27 and now to January 1. 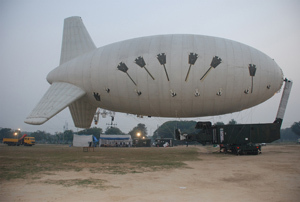 Defence Research and Development Organisation (DRDO) unveiled a medium size Aerostat Surveillance System seen moored at Agra on December 28, 2010.